Charles and Patricia have designed unique ladies evening wear for many years and are well known for their hallmark hand pleated and hand painted silks. 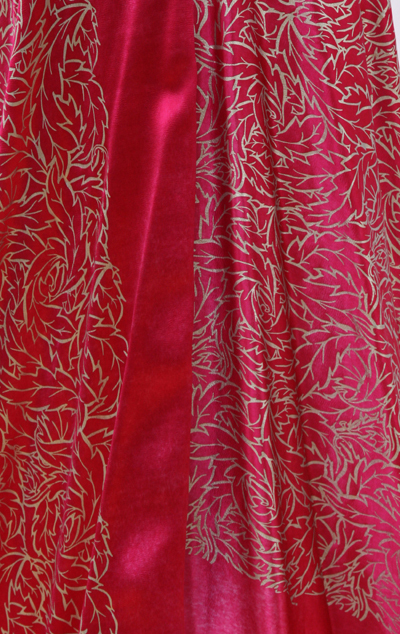 Luxurious velvets later became a part of their signature collections. 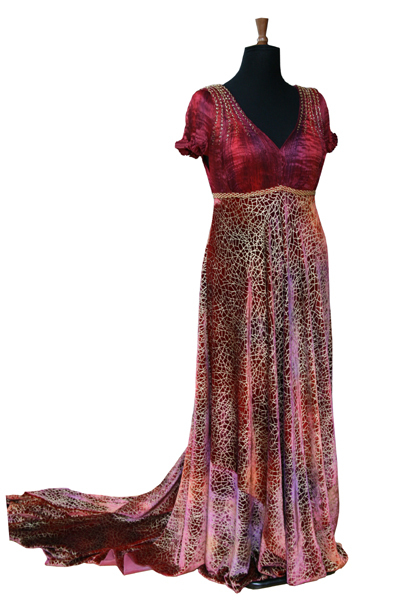 They create wonderful pieces out of the hand painted velvets some of which they apply their unique printing techniques such as devore, misted and phantom prints.Elegant bias cut dresses created from the luxurious velvets and sumptuous silks are available for all sizes. Hand pleated silk outfits – simply decorated or heavily beaded are created in any of the vast range of colours available. Bespoke pieces can be made to suit the individual and the occasion. Tulip dress – this design works well for the plus size – photographed here on a size 18 – again this style can be made with a train and in any colour from the palest silver to the rich colours of autumn. NOTE heavily beaded around the hem to give movement to the dress which falls away at the back into a small train. Lucy dress with little cropped jacket. New Becca dress with pleated jacket in heather mist.